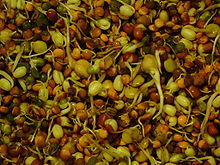 You can purchase unhulled seeds at your local health food store to grow your own fresh sprouts. Sprouted seeds are a great compliment to any dish and add nutrition to any meal. I love using them on salads or to top dishes giving the dish an extra layer of texture. How to: If you do not own a seed sprouting jar, then simply add your seeds to a sterilized clean jar, cover with purified, alkalized, antioxidant rich water, soaking overnight. Cover the jar and hold in place with paper towel and rubber band. After soaking, drain any excess water through the paper towel. Most seeds will need to be rinsed twice per day until ready for harvest. Most common seeds for sprouting are: Bean type, Mung, Alfalfa Seeds, Buckwheat Seeds, and Sunflower. There are many seeds for sprouting out there you will just have to look around to find the availability and supply in your area. Once you get the hang of sprouting seeds you can consider a seed sprouter which eases the process and makes sprouting quicker so that you can have fresh sprouts on an ongoing and regular basis. All sprouted seeds have different flavor profiles. Be sure to explore all the type of sprouted seeds to find your favorite. My favorite are sunflower sprouts which have a rich nutty flavor to them.